Student flats which would be too high and too close to neighbouring houses have been refused planning permission. 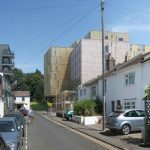 The block, up to six storeys high, was proposed for a site in Hollingdean Road, Brighton, which is currently used as a garage. And an open entrance, giving people access to the site, would have been filled in with a gatehouse. Planning officers criticised the quality of nine of the 88 flats proposed for the scheme as they would be look out on to brick walls, just yards from the Vogue Gyratory. And the lack of disabled parking spaces was also criticised. 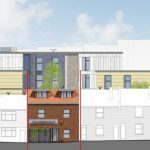 Brighton and Hove City Council’s planning policy would require five for a scheme of its size but only one was proposed. 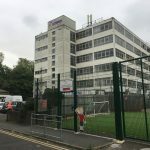 Roger Birtles, for the developer, told the council’s Planning Committee meeting at Hove Town Hall this afternoon (Wednesday 20 March): “The proposal provides much-needed student accommodation on a brownfield site near the academic corridor with access to services. “Family homes are being converted into HMOs (houses in multiple occupation) without shared amenity. Labour councillor Jackie O’Quinn, the council’s mental health lead was equally concerned about the wall and a lack of light. She said: “They’ll be packed in like sardines in a tin can. Green councillor Leo Littman said: “I like the design and I also have no objection to student housing. Conservatives Joe Miller and Andrew Wealls wanted to defer the application so the developers could come up with something more suitable. 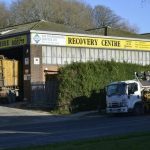 Their move was defeated and councillors voted nine to two to refuse planning permission.